As some of you may know, my Forged in Fire and Norah Wilson’s Every Breath She Takes, released yesterday. But our books actually have more than that in common. They were also both published by Montlake Romance, they’d been previously published/self-published, and they are both about psychics. Apparently, I’m not the only writer fascinated by psychics. In my case, I’m fascinated with psychics because my family has a bit of history with the phenomenon. I’ve even had a couple of brushes with ESP myself. In my case the experience wasn’t world altering. It didn’t save lives or make a difference in even the slightest way. But it happened. Twice. Without thinking, I told her “Bruce’s Mom is in the hospital. They left during the middle of the night and arrived in town this morning. But Bruce’s mom is okay now, so they’re coming by for a visit before heading home and we’ll all go to Abby’s Pizza for lunch.” Of course my mom asked where I’d come up with this news and I suddenly realized I’d dreamed it the night before. Yeah, weird—we all had a good laugh and got down to weeding. An hour later Janie and Bruce showed up. Yep, Bruce’s mother had been admitted to the hospital on a suspected heart attack, which turned out to be indigestion, and because Janie was pregnant and craving pizza, guess where we headed for lunch? This incident was a family favorite for years, but by the time I entered college we’d pretty much forgotten about it. At least until it happened again. This time I was in my university dorm room and my mom called. While I was on the phone with her, I asked how Yuki was doing. Yuki was a Japanese exchange student staying with my parents. My mom said Yuki was doing great, adjusting really well. And I said “no, I mean is he still all swollen from the bee stings? And she’s like what are you talking about. And I said “the Bee stings. From that camping trip his science class took up to Lake Wenatchee.” There was this long pause and my mom said “Yuki just told me about that five minutes ago, he hasn’t even gone on it yet. It’s this weekend. And I suddenly realized I’d dreamed about Yuki getting stung. In the dream the boys he was hanging out with were throwing rocks at this old hollow tree, and a swarm of bees came after them. Yuki ended up not going on the camping trip, and the following Monday at school he discovered all the kids that had gone, sustained multiple bee stings. I’ve never dreamed another event, but I’ve wondered what I would do if I dreamed something terrible was going to happen—something horrible, like a plane crash or a bomb. If I dreamed something terrible, and the dream started coming true, would I try to stop it from happening? Would I try to warn the people involved? If no one believed me, how far would I go to prevent the tragedy? This is the theme I explore in Forged in Fire. Beth, the heroine, has a horrible dream—a nightmare in which an airplane is hijacked and the terrorists slaughter everyone on board. Beth’s not psychic. She’s never had a dream that came true. She doesn’t even believe in ESP or premonitions. So like any stable, rational person she dismisses the dream. But when events in her nightmare start coming true, she has to make a choice—to trust her instincts and the knowledge that her dream is actually happening, which means hundreds of people are about to die. Or to walk away without doing anything. Beth chooses to try to stop it and is drawn into the nightmare herself. The really weird thing is how this scenario came to me. Because get this, I dreamed it. Yep, I had this incredibly vivid dream where this blonde woman awakes from this terrible nightmare and through the course of the morning realizes that events in her dream are coming true. I dreamed that she headed to the flight’s departure gate to see if she recognized any of the passengers, and almost fainted when she saw the hero and his friends waiting to board. Yep, I dreamed the opening to Forged in Fire. A dream, within a dream. How weird is that? Great to "see" you here, Trish. 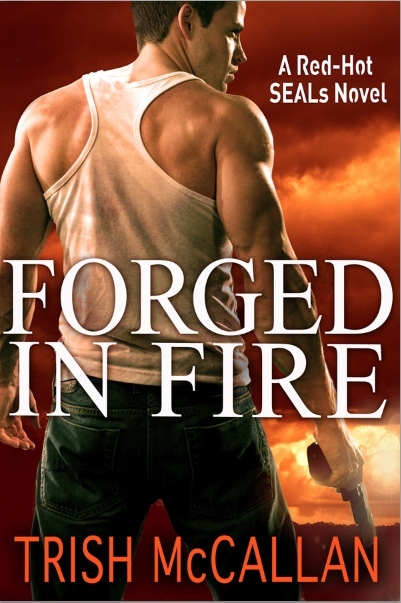 :) I had my paperback copy of Forged In Fire pre-ordered and am anxiously awaiting its arrival this week. (Like I keep saying, I love that book! Can't wait until your next book comes out. Congratulations on the new releasing of it with Montlake. Here's wishing you all the best. I'm sure the sales will continue to skyrocket. Thanks for stopping by Mal. I hope you like the new edition of Forged in Fire as much as you liked the previous one. Looking forward to hearing what you have to say on your upcoming guest blog on JRS! I find your dreams to be amazing. I've have had this book on my TBR list forever; must make sure I finally get to the new edition! Premonitions intrigue me. There is a family tale about a dream my grandmother's sister had, one that saved the lives of her two brothers and two sisters. I've never had dreams that saved someone, but who knows what the future holds. I hope you like Forged in Fire!